Augusta GreenJackets fans could catch a long home run ball from the Savannah River if North Augusta’s plans for a riverfront stadium survive litigation pending in South Carolina Supreme Court. As they do from McCovey Cove by the San Francisco Giants stadium, waterborne fans could potentially collect a home run ball from the water, visible over right field in new stadium renderings released Wednesday. 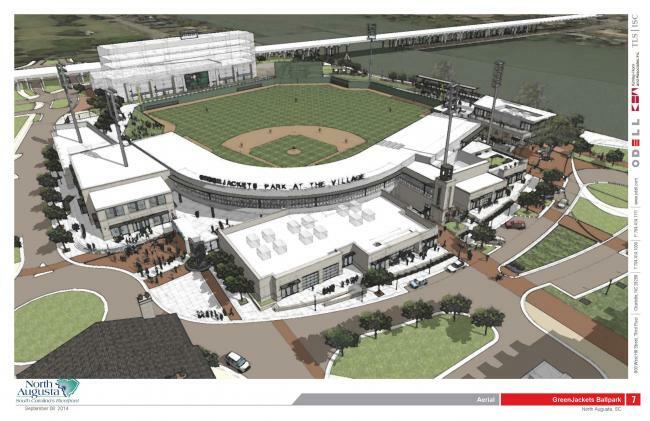 The design intentionally mimicked the stadium of the minor-league team’s parent club, but it’s a longer shot for a GreenJacket. “If somebody does that, it may be their last day with the GreenJackets, because they’re getting promoted,” said North Augusta City Administrator Todd Glover. The first detailed renderings of the suburb’s $144 million development – for which the stadium is the centerpiece – reflect efforts by architects Odell Associates and contractors to value-engineer the project after initial designs came back $9 million to $10 million over budget, Glover said. Changes include lowering the height of an elevator tower that was to include a clock, which saved the project $100,000, and raising the field a few feet above street level instead of recessing it 10 feet down, which encountered water table and other issues. “By raising it up, we alleviated the problem but we actually end up with a better product” that costs hundreds of thousand dollars less, Glover said. The renderings reveal a several-story outfield building over left field that likely will become condominiums with river views. A hotel and outfield restaurant in the designs also will have river views, he said. The development, also opposed by some residents of the upscale Augusta suburb for environmental reasons, has been challenged in court by North Augusta homeowner Stephen Donohue, who alleged the city’s use of tax increment financing to fund it breaks state laws requiring an area to be blighted to use that type of financing. After a circuit judge ruled in favor of the city, Donohue appealed. Citing a need to issue bonds to begin construction this month to get the stadium ready for the 2016 season, North Augusta asked the state Supreme Court to take up the suit, bypassing a state appellate court. The court agreed to hear the case, but has not set a date to do so.